(1980) "I Don't Need You"
(1981) "Share Your Love with Me"
"I Don't Need You" is a song written by Rick Christian and recorded by American country music artist Kenny Rogers. It was released in June 1981 as the lead single from Rogers album Share Your Love. 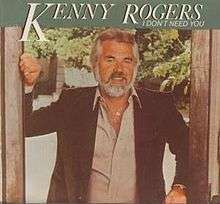 Kenny Rogers had collaborated with R&B/pop singer-songwriter Lionel Richie in 1980 with the song "Lady". After the success of that record, Rogers asked Richie to produce his next album, Share Your Love. Although the original plan was for Richie to write all the songs for Rogers' forthcoming album, the two men agreed to accept songs they both liked for the project which had been written by others. "I Don't Need You", written by Rick Christian, was one of those songs. Chosen as the lead single, "I Don't Need You" spent two weeks at number 3 on the Billboard Hot 100 chart in August 1981. The song also rose to number 1 on two other Billboard music charts, the country chart as well as the adult contemporary chart. It remained atop the latter chart for six weeks in July and August of that year. Rogers has been quoted describing "I Don't Need You" as "...still to this day one of my favorite songs", although he admitted that "I don't think I ever met Rick Christian, the guy who wrote it." Other Recordings of "I Don't Need You"
The Carpenters, recorded in 1980 but never released.